This cake was a long story in the making. My friend, Wendy, was turning 50! I’d made my reservations to visit for the big celebration. And then, she asked if I’d make her a cake when I came out. First question I asked was what kind of cake she wanted. The answer? Almond cake with vanilla buttercream icing. As delicious as it sounds, I had never made that particular kind of cake before. So I started researching recipes. I learned about how to make icing really white. I searched and searched for a fun cake topper idea. And I started baking. The first couple cakes were not successful. At all. And when I finally found the right recipe, somehow one layer cooked well and the other was grossly undercooked in the middle. Still, I took the good parts and used them as vessels to test icing recipes. Fortunately, I had a lot of tasting volunteers. It’s a tough job, but someone has to do it. Did I mention I ordered special vanilla online? And that certain butters are lighter in color than others? Or that if you beat the buttercream faster and longer, it becomes whiter? All true. And the icing was really pretty and white. And we came upon the perfect recipe. Done and done. And then, the pom pom toppers that I ordered came! I opened the box with glee. But sadly, they were not white. And upon further reading on the Etsy listing, they were ‘soft white’ which is another way to say beige. I was going to return them and order a whiter white set until I realized that the shipping cost to return them was half the price of a new set. 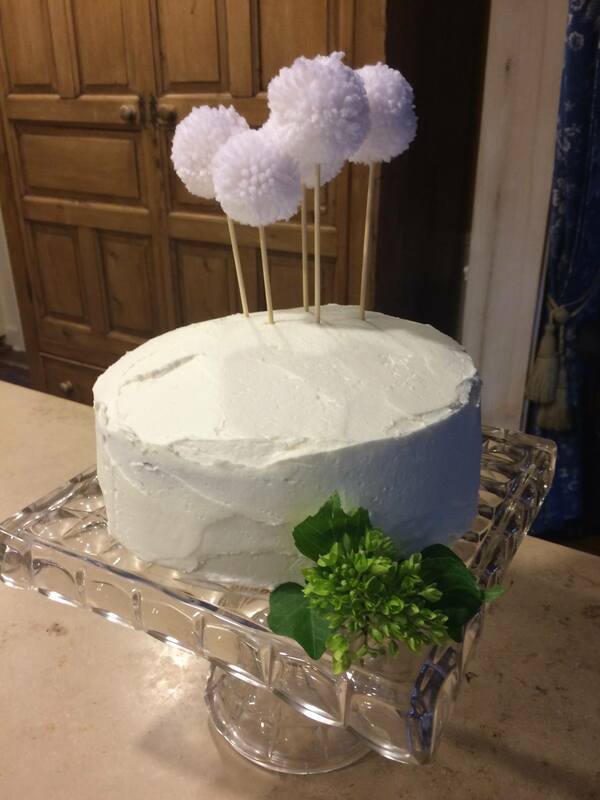 So I wrote the seller to find out how to ensure I ordered the whitest white poms and how much this cake mattered. And you know what she did? She sent me a new set for just the cost of shipping. And I kept the beige set. They’ll look pretty on a chocolate cake. But back to the cake itself. The heart of the cake. I didn’t have it right yet. But that last version? It was really tasty. Could I improve it? And then, I decided to make the layers thinner. It was a eureka moment. So I made the cake again. (Not to try to get your sympathy here, but it’s a lot of steps and a lot of dishes. And a lot of eggs!) So I made the batter and split it between 3 layers. And you know what? It came out perfectly! So pretty. The layers released from the pan perfectly. They were golden and perfect and even and lovely. That’s when I decided to take this actual cake with me to Omaha. So when they were absolutely cool, I froze the layers. Now, you might be asking yourself how I planned to get the cake to the midwest in reasonable condition. Great question! It just so happened that the perfect styrofoam cooler and a box it fit into exactly. I’d just take the layers in the cooler with icepacks and check it through as baggage. I’d also pack my special, favorite icing spatula with me and the vanilla – and of course the pom poms. This plan was foolproof! I’d have layers and could make the icing in Omaha and assemble a beautiful cake. It was almost midnight when I stood in the baggage office nearly in tears explaining to the clerk about my concerns that it would defrost and get stale. She gave me a piece of paper and told me that they’d do their best (and by the way, please step away from the computer and get behind the line). At this point, I decided that the fellow who checked my bags curbside at Dulles took my cake home to his family. Do I know this was irrational? Yes, I do. But the thing is, I was in a terrible rush when my boys dropped me at the airport. I was supposed to fly out of BWI but that plane was delayed and I’d never have made the connection, so they rerouted me. My guys drove me (and unfortunately got stuck in horrendous traffic making them late for their dinner date with their aunt which sucked). I never do curbside check-in but, as I mentioned, I was late and more than a little stressed. The guy was so sweet and I was relieved to dump my big bag and the box. He asked me what was in the box. I told him it was a cake. And that is why, when it went missing, that I suspected that poor guy. While I was very sad, I did actually invent a story in my head that he needed that cake. Maybe it was his daughter’s birthday and he had to work and didn’t get a chance to buy a cake. Yeah, I have a great imagination like that. So, back to my story. There was no cake in Omaha. Once I caught my breath, I saw that my friend had 3 9″ cake pans. Check. She and I went to the store and bought ingredients. And we went to Sur la Table and bought an icing spatula. I called Southwest again and again. No cake. And then, at nearly midnight they called. They had the box! Should they refrigerate it? (How nice that they asked, right?) I said no. Wrote it off. It was clearly defrosted and I knew I was starting over. I’d pick up the box the next day because frankly, I love that spatula. We were headed to the airport at 5pm the next day anyway to pick Molly up. And since the cake was clearly a train-wreck, why rush? The box. I got the box! And when we got back to Wendy’s house, I opened it and found a Christmas miracle. The ice packs were still frozen. The cake was perfect. And so, the next day I whipped the heck out of a white, vanilla buttercream and put the cake together. I put the pom poms in and cut a sprig of greens. That cake? It tasted like love. I’m glad you ended up getting the cake back and I’m glad it was still perfect.